“Sana matapos na yung isyu na ’yan, dahil paulit-ulit lang naman na hindi katotohanan! 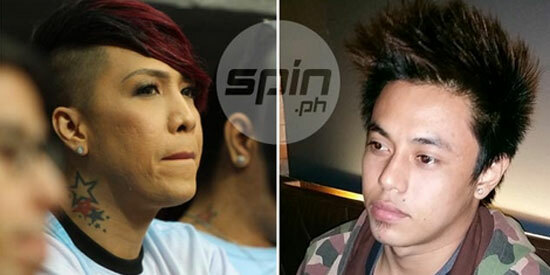 Isang multo ’yan ng imahe ko na gusto ko nang mabura totally," says Terrence Romeo (right) about his rumored relationship with comedian Vice Ganda (left). PUTTING a pestering rumor to rest, PBA rising star Terrence Romeo on Friday categorically denied that he had a relationship with TV host-comedian Vice Ganda. The GlobalPort rookie has long been linked to the popular showbiz personality from his days with the Far Eastern University team in the UAAP which Vice Ganda, an alumnus, has been openly supporting. The rumors kicked up anew over the past two weeks when Vice Ganda, Jose Marie Viceral in real life, posted a tweet saying "It’s over," suggesting that he has broken up with his boyfriend. Contacted for comment by Spin.ph on Friday, Romeo denied that the statement or the Facebook page which was curiously followed by fellow PBA players was his. But the 21-year-old conceded that the FB statement reflected what he had long wanted to say about long-standing rumors linking him to Vice Ganda. “Hindi ko FB ’yun. Pero okay na rin ’yung ganun atleast alam ng mga tao. Mas okay na ’yung ganun na may nagsabi (sa Facebook para sa akin) ng ganun. Kasi totoo naman yung sinabi niya na wala kaming relasyon (ni Vice),” Romeo said. “Sana matapos na ’yung isyu na ’yan, dahil paulit ulit lang naman na hindi katotohanan! Isang multo yan ng imahe ko na gusto ko nang mabura totally,” he added.